Okay. I know there’s been a huge influx of cheese-related food here lately. And I’m gonna be just as guilty about it this week. So bear with me a little while more? And for those that just can’t get enough of cheese, hooray! More cheese infused food! Now I’ve made some meatballs way, way, way back before this blog was well known. I called them Parmesan meatballs. The problem was, whenever I made them, I always made an army of meatballs to justify the whole process. I mass produced meatballs. Oh say, about 55 or so every time I made a batch? And while an army of meatballs sounds like days of delicious meals, not everyone wants so stand by the kitchen counter rolling 55 meatballs in their hands. So today I’m gonna break down the batch a little and make it more single family sized, or couple sized. 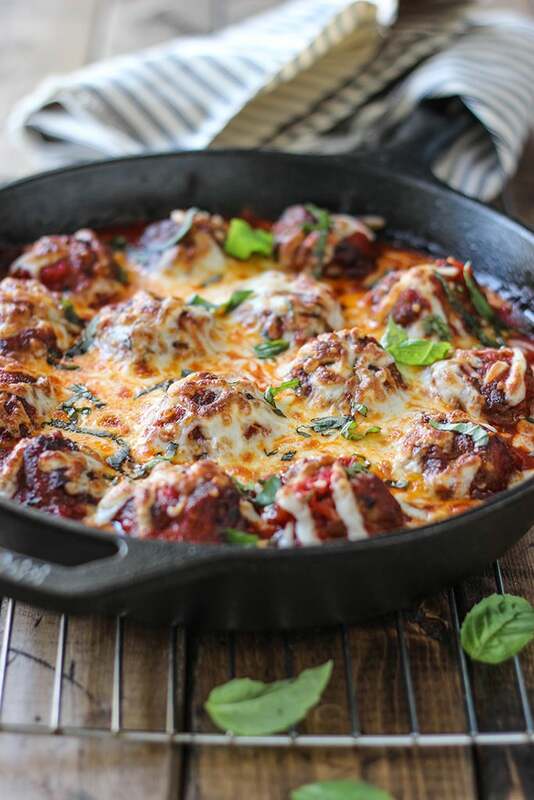 And instead of giving you plain meatballs that really don’t look great all naked and stuff, I’m dressing these up with marinara sauce and cheese. 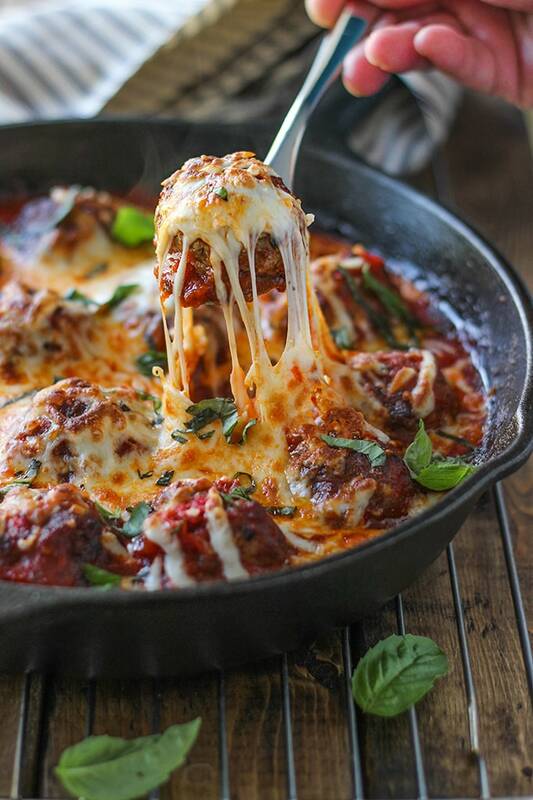 All done in one skillet, your meatball heaven awaits you. Taking cues from my Parmesan meatballs, these have dried Parmesan packed tightly in them and it really makes a difference. Now you can use these meatballs with some demi baguettes to make a sub or toss it with some freshly cooked pasta. Or just munch on them straight from the pan if that’s the way you roll. I leave the eating how…up to you. The important thing is to enjoy it! 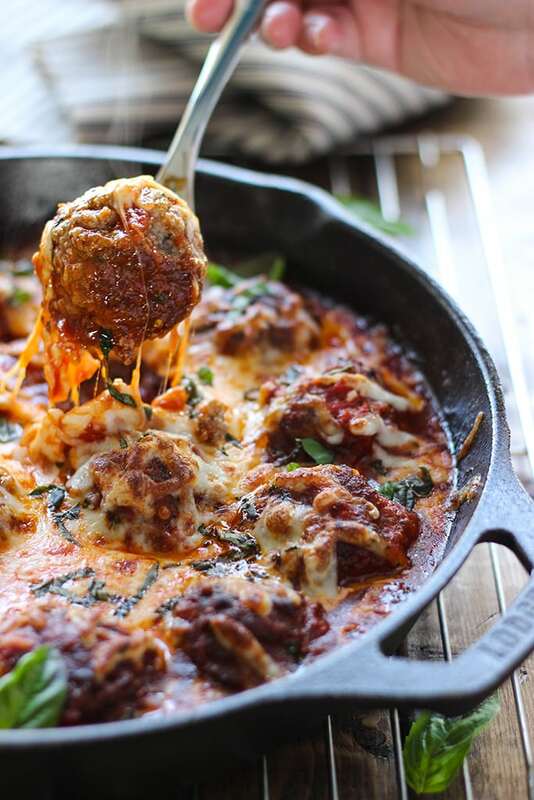 If you don’t feel like making meatballs from scratch, you can shortcut your way to this dish with some frozen Italian meatballs. But for those that wanna make it from scratch, you can make them the size I suggested or go bigger, but you will have less meatballs to go around. I used an ice cream scoop to get them sized. They’re about the size of golf balls. I ended up with 16 meatballs. That’s about 4 meatballs per person. Then it’s pan-frying them in the skillet until they are well browned. Get the pan and oil nice and hot before you start pan-frying so they don’t stick. I have a 10″ skillet so I did this in two batches. You’ll want some space for them to roll around so you can brown them on all sides. I used just enough oil to coat the bottom of the skillet so they wouldn’t stick, about a tablespoon. 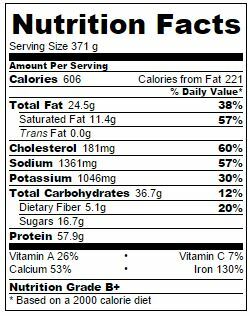 Depending on how lean your ground beef was, some fat will render and you’ll end up with more oil than you started with. Use this oil to brown your meatballs. When you’re rolling your meatballs around to brown, do it gently! The same goes for when you’re reintroducing them back into the skillet and marinara sauce. Easy does it! Remove any excess oil before you add in the marinara sauce. And for the marinara sauce there are also options. Go for a recipe that’s already a staple if you have one. Stick with a jarred one if that makes you happy. Or dress it up with some seasonings. I like to add some Worcestershire sauce, beef bouillon cubes, red pepper flakes and balance out the sourness of the marinara with a teeny tiny bit of sugar. If that sounds right up your alley, you can use this recipe as a general guideline on what to toss in there. I really should update that picture. Add the meatballs one at a time and roll them around in the sauce to get them fully coated as you add them back to the skillet. Then simmer for a little to marry the flavors. You’ll want to reduce the heat around this stage because anything tomato sauce related means a huge mess. Reducing it to a gentle simmer helps keep it contained. Wear an apron! Once it’s done simmering, top with some mozzarella cheese. Add some Parmesan cheese too for good measure if you want. Now I don’t have any covers for my cast iron skillets so instead of covering it and melting the cheese that way, I’ll be broiling it for a few quick minutes to melt that layer of cheese. If you have a cover, go for it. If you want a nice browned cheesy layer, broil it! And that’s that! Break out your baguettes or drain off your pasta. It’s eating time! 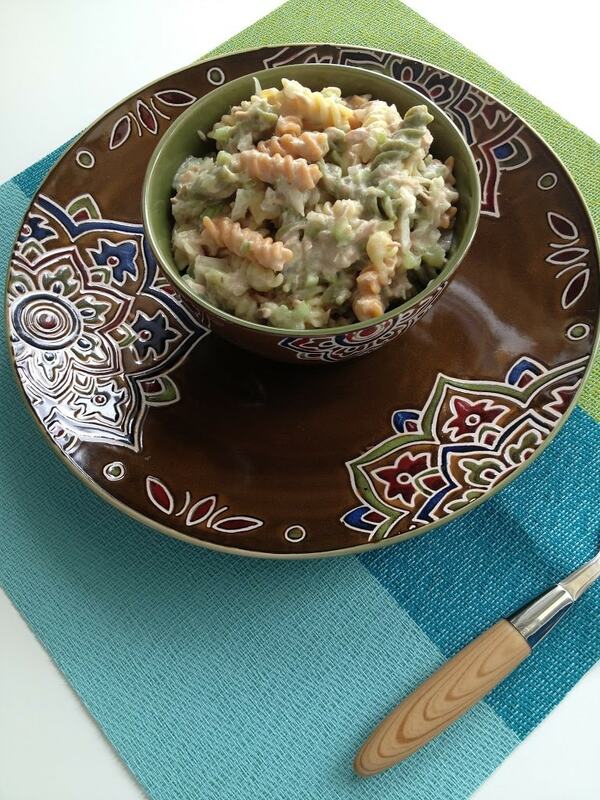 Amazing blog with inviting photos and smart looking recipes. Well done. Farah! Just pass me the skillet! And a large spoon! These are coming to my kitchen soon and won’t be there long! Your photos are stunning! 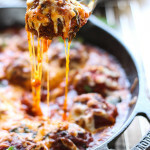 The meatballs are to die for…and all that gooey cheese…YUM!! Gooey cheese is the best! 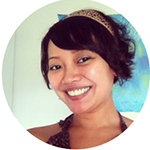 Thanks, Thao! Omg! This looks so good! Your pics looks totally amazing. Gosh, I gotta try this out. Yum! I may or may have not overdone the cheese string shots but they are so much fun to look at! Thanks, April! So it looks like the only chance the meatballs get to cook is when you brown them and when the cheese melts. Is this really enough time to cook them thoroughly? I fail at meatballs all the time–they are either too dry or not cooked enough. Heya! Don’t forget the simmering it does in the marinara sauce in between the stages you mentioned! I’ll update the directions a little so it’s not too ambiguous during the browning part, that should take about at least 5 minutes. A good way to check if the meatballs are cooked is to use a meat thermometer. It should read about 165 degrees F. Hope this helps you on your meatball journey! love your website and recipe. Doo not like ads that load and take you from recipe to the ad. very distracting and not needed. Thank you, Joyce! I’m sorry about the ad that did that, I try to filter those kinds of ads out because I personally find that kind of advertising annoying but sometimes it slips through the filter. 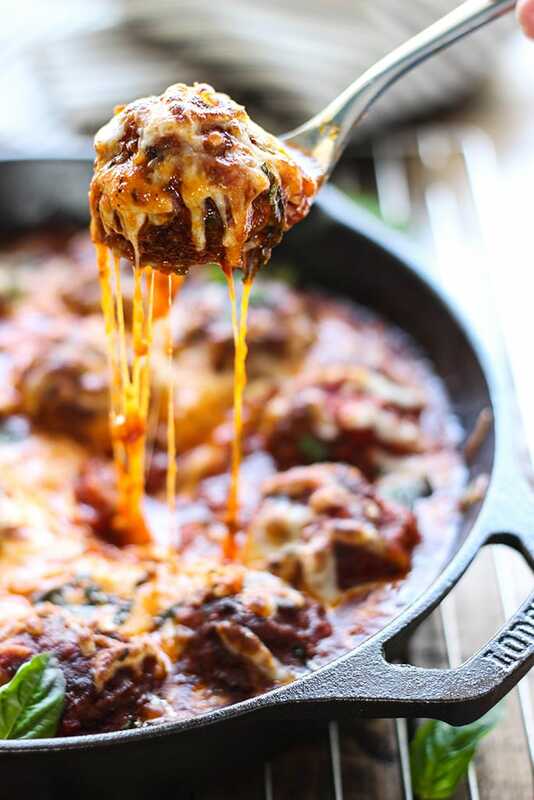 I made your Cheesy Meatball Skillet for lunch today – awesome. It was hard to do; but, I save a little to have for dinner tomorrow. I ended up having it tonight on a toasted wheat hoagie bun. YUM! Now I am off to subscribe to your emails. Thanks a bunch. I cannot wait to try these! 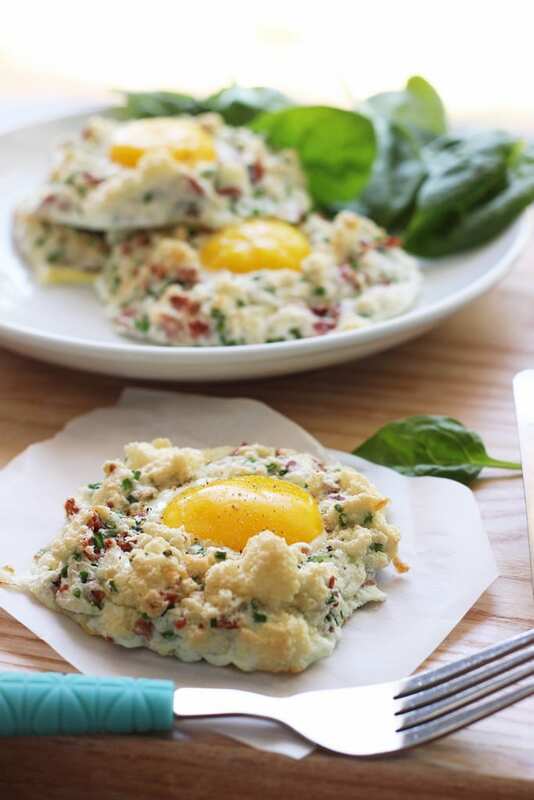 I’m doing the whole low carb thing.. so I will be swapping the breadcrumbs for ground porkrinds and serving spegetti squash on the side but these seem amazing can’t wait!!! Hey thanks, Megan! Hope you love it and good luck with your new low-carb diet! Hi! 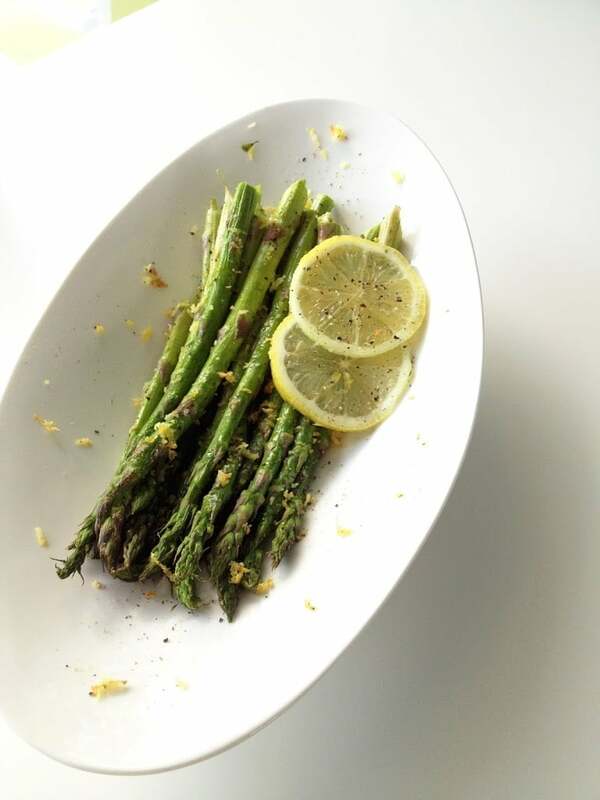 I just wanted let you know I made this recipe last night for dinner and it was very tasty and great for a weeknight meal (not too laborious) with some roasted broccoli. I subbed panko for the breadcrumbs to cut carbs, though I accidentally threw the basil in with the meatballs (it actually worked out!). 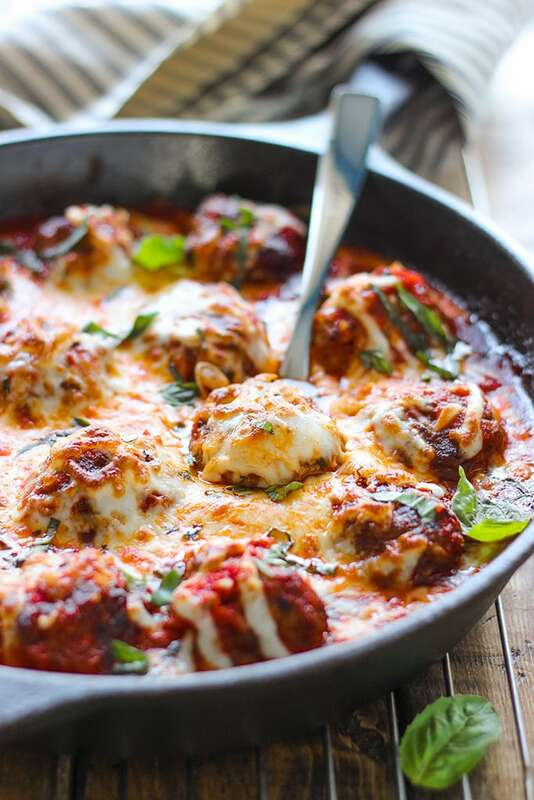 Yum, basil meatballs. That’ll work too! 🙂 Thanks for sharing the love and letting me know how it worked out for you, Stacy! These meatballs are to die for !! this is my go to recipe ! Thank you so much for sharing, they are a favorite in my family and I recommend them to everyone !! What kind of marinara sauce did you use? Store bought, or home made? 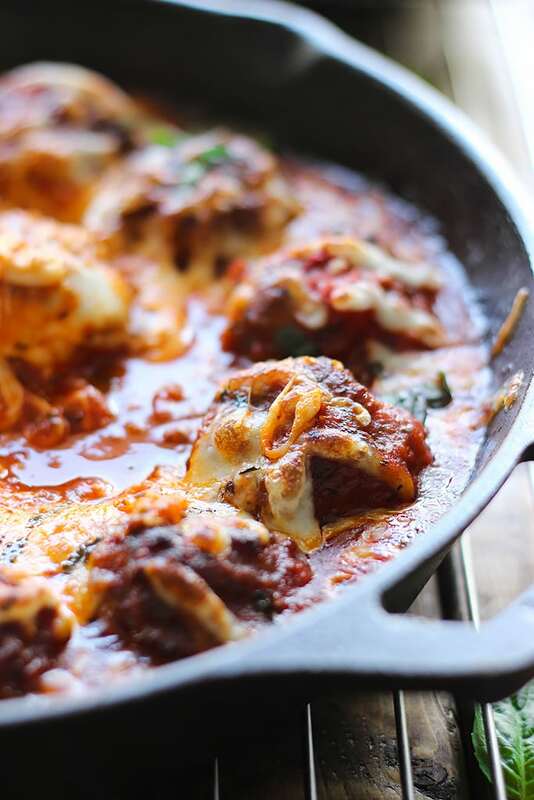 I use Bertolli’s tomato and basil sauce as a base and build off that with this recipe. I sub the tomato puree/sauce in that recipe with the tomato and basil sauce and toss in the rest of the ingredients for a homemade marinara sauce. I just like the flavor better than the stuff straight out the jar. But if you don’t mind it and want to save time, you can just use the basic jarred stuff! Really looking forward to trying these tonight! I wanted a made-from-scratch meatball recipe that wasn’t too laborious (or too hard for a young husband who’s still figuring out to cook), and this looks like just the thing! I hope it worked out well for you, Taylor! These are my favorite meatballs, the Parmesan and Worcestershire sauce just makes it so good. Also hope the instructions were easy to follow for someone new to cooking! Sure you can. Try 425 degrees F for 10-12 minutes.